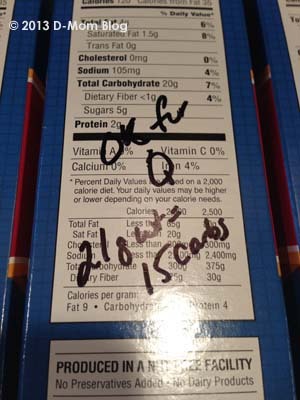 Always use the consumer package for nutritional information as formula and ingredient changes may occur at any time and may not match the information provided here. We eat a lot of pancakes and waffles in our house. But I’m finding it not so easy to find pancake mix that doesn’t have milk in it. I don’t shop at Meijer that often, but I’ve been heading there occasionally because they carry a few items that are free of the allergens we are avoiding. 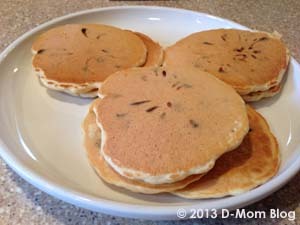 I usually make chocolate chip pancakes using Enjoy Life* chocolate chips. 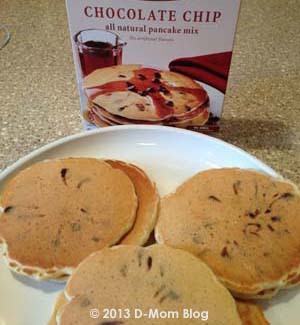 But on my most recent trip, I spotted this Meijer Naturals chocolate chip pancake mix. I used soy milk instead of regular milk. The kids thought they were very good and we all agreed that they were generous with the chocolate chips. I would probably buy this mix again. I will say that I used the ingredient measurements to make 14 pancakes, used a 1/4 cup measuring cup to pour them on the griddle as instructed, and it only yielded 11 pancakes. If your child has a milk or tree nut allergy, what are some of your favorite finds? *Enjoy Life products are free of the top 8 allergens. 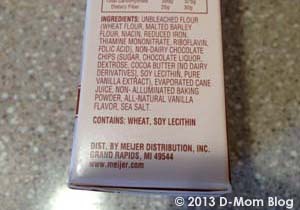 Always read labels of individual products as ingredients and manufacturing may change. 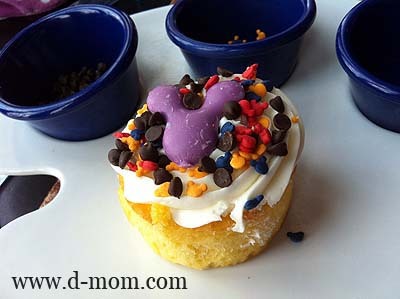 Any allergy information provided on D-Mom Blog does not constitute medical advice. Please read the disclaimer and consult your physician for any questions you may have. 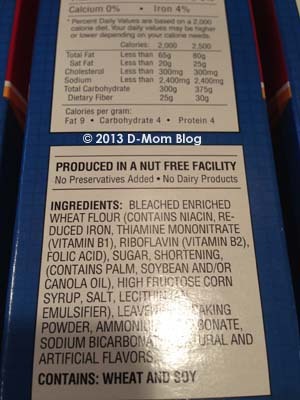 My daughter was so excited that the snack served at school one day was not only milk-free, but that the package specifically said that it was made in a facility free of nuts. The school nurse snapped a picture of the box and messaged it to me so that I could remember what to look for at the store. 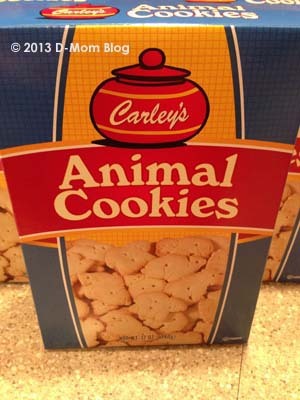 I went to Menard’s in search of these animal crackers and was so bummed that the box stated that it was made in a facility with tree nuts! It just goes to show that if your child has a severe food allergy, you need to check the package every time. Q and I popped into Menard’s for something else and I thought I would check out the snacks again. This time the box said that it was made in a nut-free facility. Score! We put four boxes into our cart, lol! I will say that although we couldn’t purchase too many of the Carley’s snacks because they either had milk or were made in the same facility as tree nuts, I am completely impressed that the company has very thorough labeling, far exceeding government standards. If only every company cared enough to actually label for potential cross-contamination. That afternoon I did a little math to determine the weight of a 15 carb serving and made up a bunch of single-serve bags. 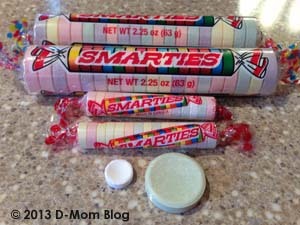 There is an urban legend that Smarties*, which we use to treat low blood sugars sometimes, come in a giant size. I had never come across them. Not that I’ve been actively looking for them, but I have never seen them. Q and I were at Meijer one day (a Midwest chain similar to Walmart). We rarely shop there (or Walmart for that matter). But when we were in the long check out line, Q was perusing the trinkets and candies that they tempt you with while you wait. She noticed giant rolls of Smarties and asked to purchase a few. Turns out they weren’t “giant,” they are actually “mega” size! One roll of regular Smarties has 6 grams of carbs. One roll of giant Smarties has 25 grams of carbs. Two of the Mega tablets is 5 grams of carbs. 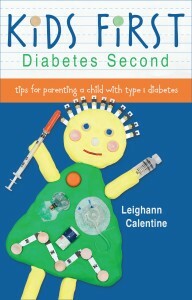 Can you spot the Smarties on the cover of my book Kids First, Diabetes Second? *Not to be confused with Canadian Smarties! After Q began her complete milk elimination Thanksgiving weekend, we were craving something sweet. 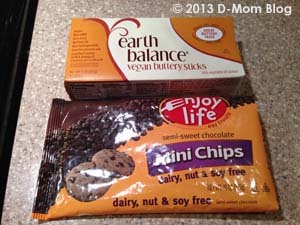 I hit up a natural foods store to see what they offered and found several types of candy bars and chocolate morsels all made by Enjoy Life. 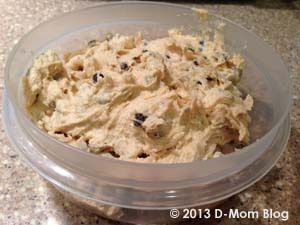 I made chocolate chip cookies using the classic Nestle Tollhouse recipe substituting Earth Balance for the butter and the Enjoy Life chocolate chips for the Nestle ones. I ended up freezing half the dough, which was much appreciated a few weeks later. 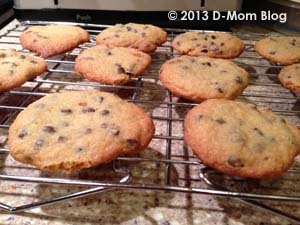 The cookies turned out great with the substitutions and were enjoyed by all! Carb count? I don’t know. I didn’t have it in me at the time to figure it out and I made an educated guess that, if I recall, was pretty close. The Nestle recipe says 15 carbs for 1/60th of the batch. I’ve since found out that Baker’s and Ghiradhelli make semi-sweet chocolate without milk. Both brands are much cheaper than Enjoy Life. But the good thing about Enjoy Life is that all of their products are free of the 8 most common allergens. If anyone knows of a source of the Enjoy Life chips on the cheap, please let me know! My kids have always been milk drinkers. So much so that we got delivery of milk in glass bottles on a weekly basis. This fall they seemed to ease up a little on their milk consumption. Then at Thanksgiving we completely eliminated milk from Q’s diet after skin tests revealed the allergy. My five-year-old son has declared that water is healthy and no longer wants milk at school lunch (Darned if I didn’t prepay enough to get milk at lunch every day this year! ), at snacks, or at bedtime. This weekend he drank water like it was going out of style. He drank like a fish. He filled cup after cup. He asked me to grab him refills as he built the last of the new Lego sets from Christmas (we’ve been slowly doling them out). 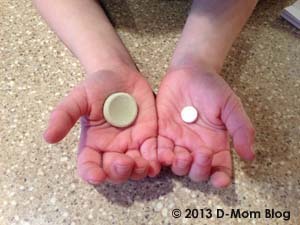 At bedtime he filled the Dixie cup three times at the bathroom sink. And of course my mind went THERE. If you have more than one child and you are reading this blog, chances are you know the deep, dark place that is THERE. I debated checking his blood sugar in the night, but decided to check him in the morning. One by one, oldest to youngest, we checked our blood sugars. 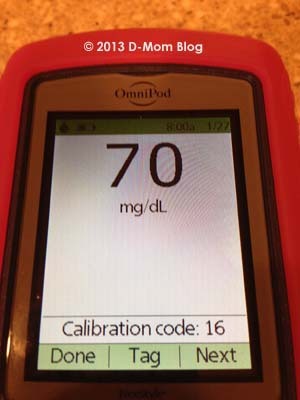 It’s bad enough in those five seconds that we are waiting for my daughter’s BG to show up, but what about for three people who do not have diabetes? 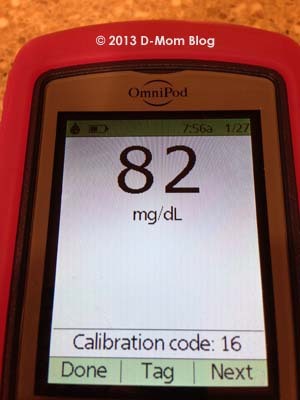 What if one of us had a fasting blood sugar that was high? Phew, nothing to worry about. Don’t we encourage kids to make healthy drink choices and fill their glasses with water? Of course. 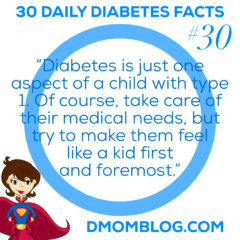 But when your child without type 1 diabetes is on his 8th glass, your mind goes THERE. It wouldn’t be the end of the year without a “top” list post, would it? Some of these are firsts for us, some are exciting, some are unwanted. But here are twelve diabetes-related things that have impacted our family. 1. It took tremendous effort as a family for me to write Kids First, Diabetes Second. I wrote each Sunday either at the library, locked into my home office, or with the laptop perched on my knees in bed. My husband and kids were very understanding. Q is so proud of me which means the world because she was obviously the inspiration. I have had wonderful feedback from families who have read the book and commented that it fills a necessary gap of information and support that the medical team doesn’t provide at diagnosis. 2. Partially in support of the book (we did a book signing in the OmniPod booth*), Q and I were able to head to Orlando for the Children With Diabetes annual Friends For Life conference. It was great to meet so many families in person. 3. Q not only flew for the first time (four times if you count each leg of our travel), but she also went to Disney World. Since we were already in Orlando, I couldn’t resist finding the time to get her to Disney, even if it was only for one day. Disney with Diabetes is totally doable. We tested often, had plenty of supplies and low blood sugar treatments on hand, and used a Guest Assistance Card to help keep us out of the July heat and reduce wait times. 4. 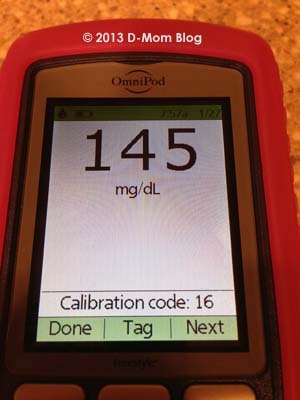 Q was finally old enough to go to diabetes camp. 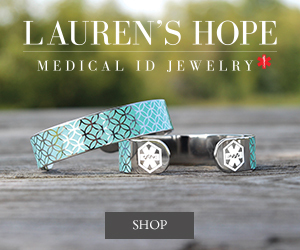 It was horrifying and embarrassing to me that her blood sugar was 300+ when I checked her in. Horrifying to her was that they made her pee in a cup to check for ketones! But after that she had a great week and is looking forward to returning again each year. She even had a top bunk, which I think made me more nervous than handing over her diabetes care to someone else. onships with over the past few years. 6. We added a new piece of diabetes management equipment to our arsenal. 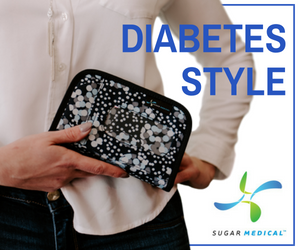 We hadn’t given much thought to having a continuous glucose monitor and always thought we would wait until it was integrated into our insulin pump. 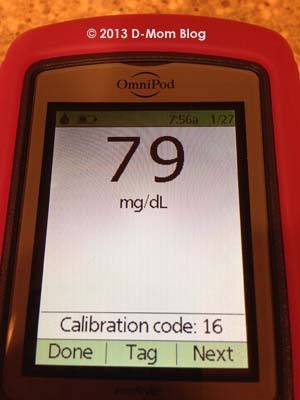 We were given the chance to try the Medtronic mySentry* and associated CGM in the spring. (The mySentry works with their integrated pump/CGM, but we only used the CGM function). 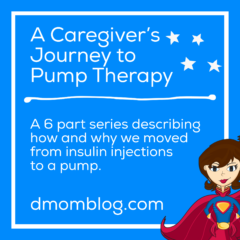 The Medtronic CGM wasn’t quite right for us, mainly because we didn’t want to utilize the insulin pump function and that was the only way our insurance would cover it. 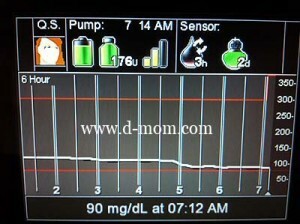 But using a CGM made us realize how much we valued the contextual information it could provide. We got approved for the DexCom and have been using it almost every single day ever since. 7. 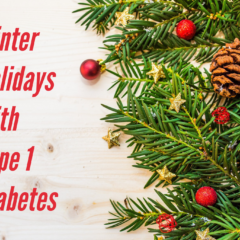 My social media and writing has gone beyond D-Mom Blog and Kids First, Diabetes Second this year as I contributed to other websites such as OmniPod’s Suite D, Sanofi’s The DX, and Disney Family.com. 8. Q has always done a lot of sports and activities, but this year she did her first play. For six weeks there were two or three week night practices from 6-8:00 pm, which completely threw our schedule off. Performance week was six nights of two to three hour practices and performances with two shows on the last day. Either my husband or I stayed for each of the practices. But after the second performance we decided that she would be okay backstage without us and we could sit in the audience. 9. The D-Mom Blog Facebook page eclipsed 2,000 likes. It is definitely bittersweet: I’m glad that families are looking for support online, but at the same time I’m sad that so many people need it. 10. For Diabetes Awareness Month I posted a daily fact, tip, or thought across social media channels including Facebook and Twitter. 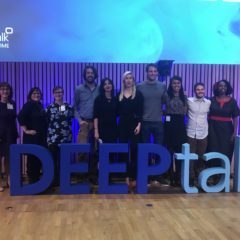 It was incredibly well-received and I hope that as people shared these thoughts on their own timeline that the information was disseminated beyond the diabetes community. You can view and download all 30 Diabetes Awareness Month facts, tips, and thoughts as a PDF. 12. I was a little reluctant to try a total milk elimination for Q, mainly because it’s a pain in the arse. But we decided to take her off of milk entirely for 2-3 weeks Thanksgiving weekend. (After having pumpkin pie with whipped cream!) I was thinking that it would clear up the eczema on her hands and maybe some of her stuffiness, but I was completely astounded by the real effect that was noticeable from day one: low blood sugars. (And of course none of this is medical advice. Ever. **) After a week of low blood sugars, multiple low blood sugars each day which each required multiple treatments, I asked the CDE if it was coincidence. She said that during an allergic reaction the body produces histamine and that histamine raises blood sugars. So that’s where we are now: figuring out how to deal with all these lows and adjust her basal rates and insulin:carb ratios to even her out. And she wants cheese so bad…who wouldn’t?! In 2013 you can look forward to more D-Mom Blog as you know it, but I am always open to ideas for content or direction. And of course I love guest posts if there is a story you would like to share! I’m so pleased to announce that I will be devoting most of my time in 2013 to writing, advocacy, and volunteering. I hope to take on more freelance writing (websites or print), social media consulting jobs, and editing work. For more information on my professional work, please visit LeighannCalentine.com. 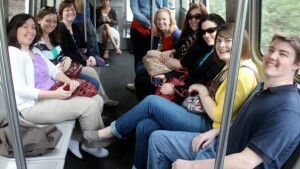 *Disclosure: Insulet paid for some of our travel and conference expenses for our appearance in their booth. Companies paid for my travel to their corporate events. Medtronic loaned us a mySentry and CGM and gave us associated supplies. No compensation was received for social media events or product trials and opinions are always my own. **Disclaimer: The information provided on D-Mom Blog is for entertainment only and should never be considered medical advice. Please consult a physician with any medical questions you might have. Please read the disclaimer.